The 12m Lulu Pearl Tent and the 21m Dana Pearl have a modular design and can be configured in a number of different ways using extension areas at the side and a veranda at the front, depending on the number of guests you expect at your event and how you would like to entertain them. 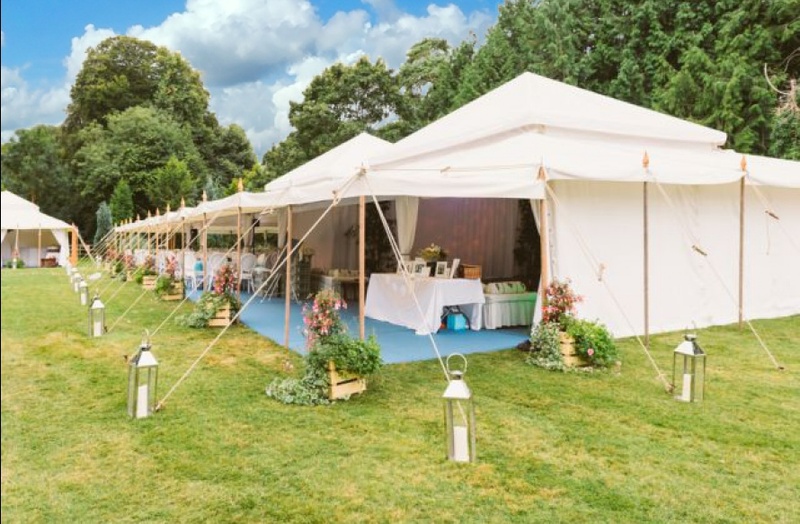 Recently the Oyster Pearl tent has been added into the collection which is also available in three sizes – 12m x 12m, 12m x 18m and 12m x 24m and has a similar capacity to the Lulu and Dana Pearl structures and the same flat white interior, traditional rope and finial detailing and canvas exterior. 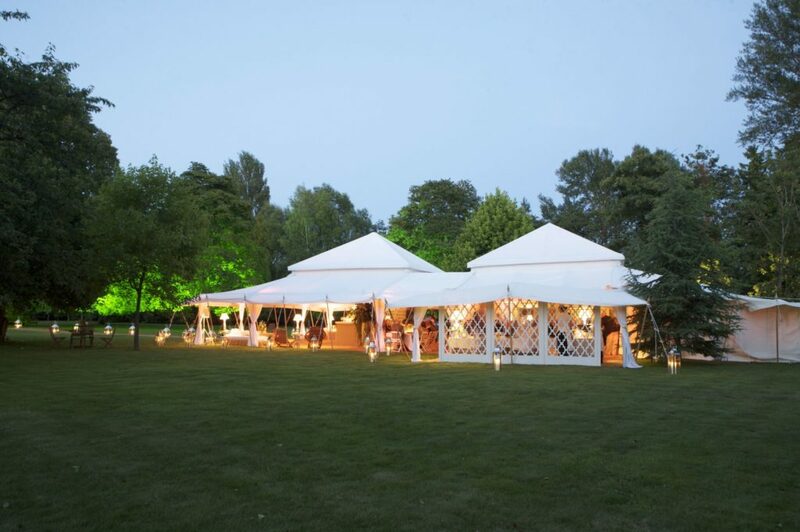 Made in the UK from the finest white canvas, our Moghul marquees are both waterproof and fire-proof. Each component is made using the highest quality materials, and our structures adhere to strict British standards and withstand bad weather and winds of up to 50mp. 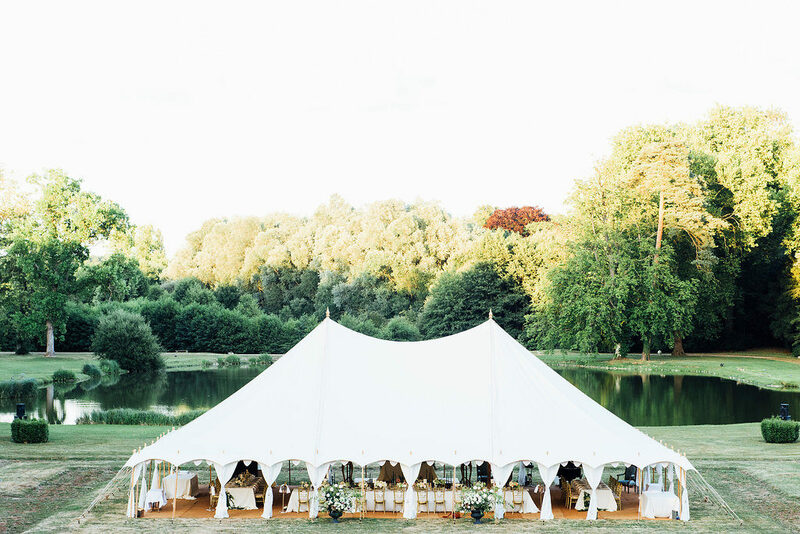 These unique marquees are as stunning inside as they are outside. The dramatic pyramid top creates a luxurious vaulted ceiling providing the ultimate light and airy atmosphere. The same frame tent structure as the 12m x 12m Lulu Pearl but larger at 21m long and with two peaks in the ceiling. 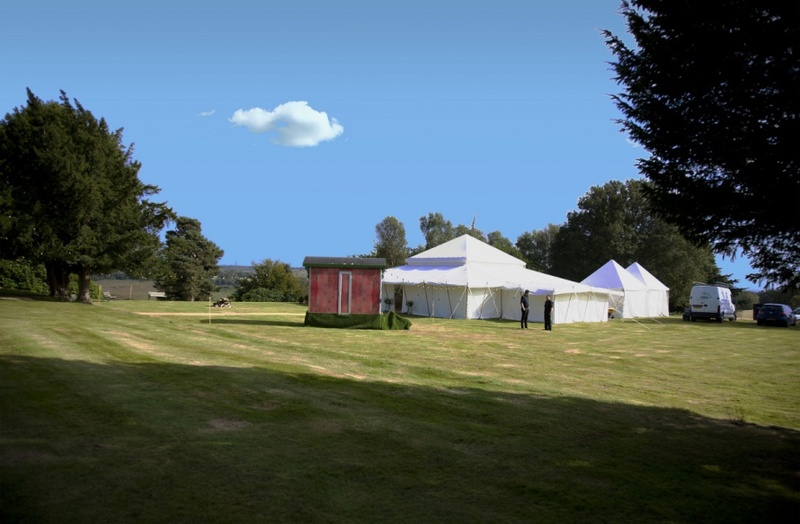 Its standing capacity is 350 people and can seat up to 240 people purely as a dining tent or 160 with space for a dance floor and stage. Adding Ampio and Picco extensions to the side can increase this capacity to 220 people. Build-time required – 3 days. If extra space is required 4m x 6m Ampio extensions or the 12m x 3m Picco extension can be added (one per width, two per length) – perfect for incorporating a stage/band, extra tables, entrance/cloakroom, bar, lounge or chill-out area, and many other applications such as guest-book video signing room. The 12m x 12m Lulu Pearl Tent is the smallest of our marquees, but its modular design means that it’s certainly no second best. 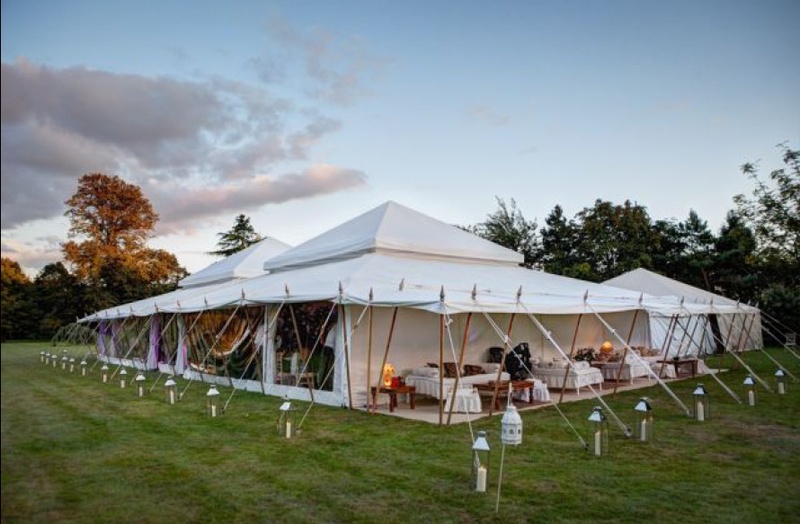 It can be configured in many ways, making it ideal as a wedding marquee, dining or reception tent. Its standing capacity is 200 people and can seat up to or 160 people if it’s being used purely as a dining tent or for 90 people with a dance floor and stage. If extra space is required 4m x 6m Ampio extensions or the 12m x 3m Picco extension can be added (one per side) which can be ideal for incorporating a stage/band, extra tables, entrance/cloakroom, bar, lounge or chill-out area, and many other applications such as guest-book video signing room. Build-time required – 2 to 3 days. 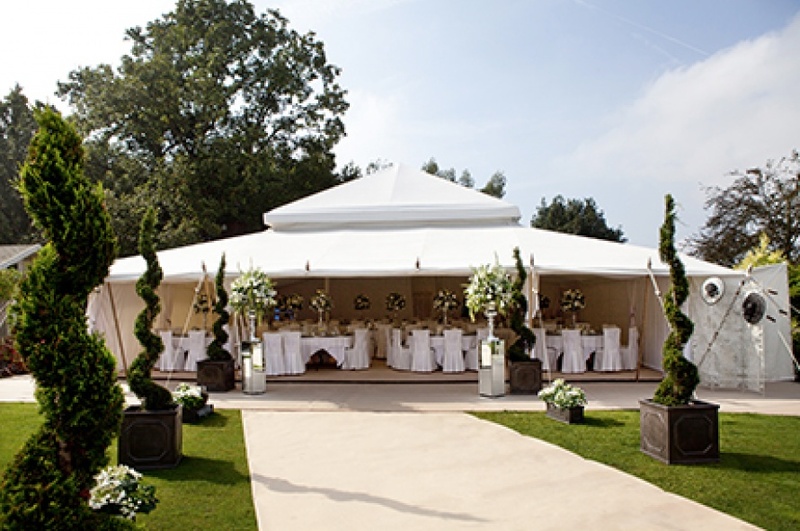 The Oyster Pearl Tent comes in five sizes – 12m x 12m, 12m x 18m, 12m x 24m, 12m x 30 and 12m x 36m and can be either used in conjunction with the other Pearl structures as a ceremony area or reception tent for larger events or as a stand-alone party marquee accommodating dining, dancing and lounge seating for up to 300 guests. Build-time required – 1 day or longer if draping in the ceiling is required. Ampio and Picco extensions are not possible with this structure which is a stand-alone tent. Introducing the The Round Oyster, it’s high peaked ceiling gives an intermittent feeling of space and light. It requires 16m across of space to be able to erect it, and is 12m across in floor space. Can hold 120 standing guests or 60 people seated for dinner. Build-time required – 1 day. 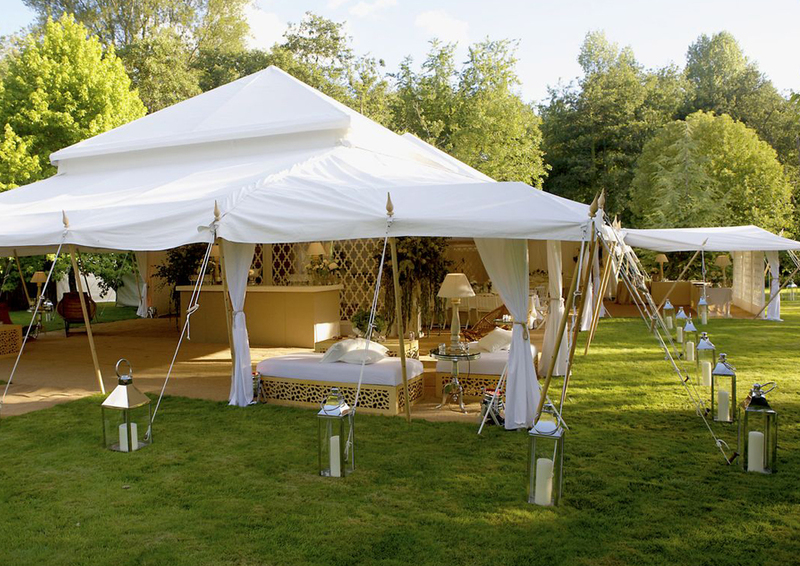 The 11m x 11m Lulette Pearl Tent is a handsome Moghul tent with four poles supporting it’s central pyramid elevation. The Lulette requires 15.5m x 15.5m of space to be able to erect it, and provides a usable square meterage of 121m. Its standing capacity is 100 people and can seat up to or 90 people if it’s being used purely as a dining tent or for 70 people with a dance floor and stage. Build-time required – 1 to 2 days. Note that the Ampio and Picco extensions cannot be used with this tent. Prices from £5,499 + Delivery and VAT. 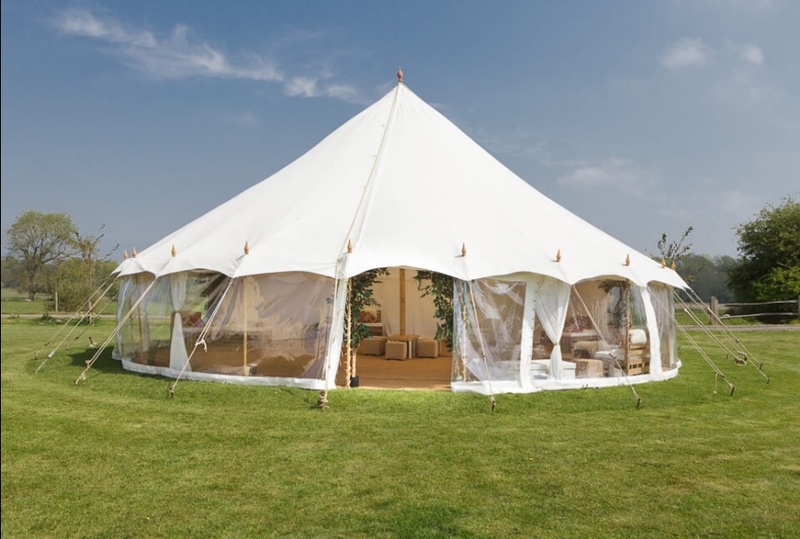 The Mini Pearl Tent has a floor space of 6m x 6m, and requires a 9m x 9m area to erect it in to account for the veranda and guide ropes. 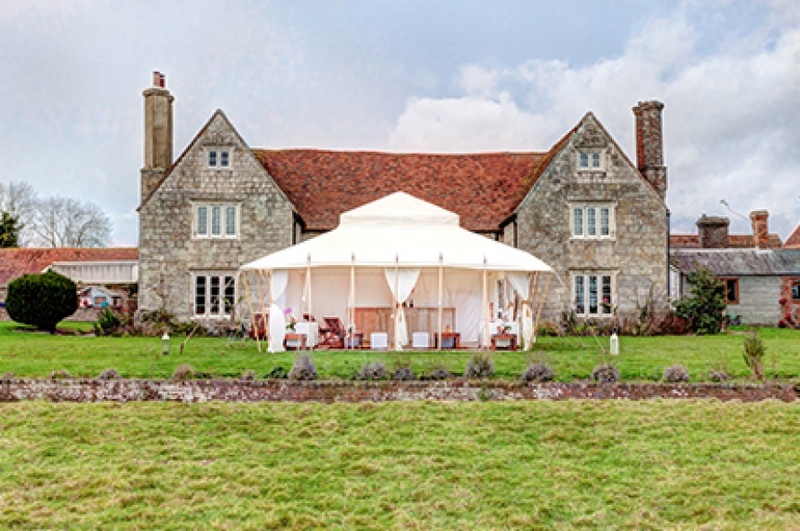 It is ideal as a stand-alone champagne/ reception tent and works in harmony with the other Pearl structures or could be used as a stand-alone garden party marquee. The 6m x 6m Mini Pearl can hold 70 standing guests or 40 people seated for dinner. These 4m x 6m extensions bolt directly onto the side of the Lulu and Dana Pearl structures to create ‘rooms’ connected to the side of the main area which are ideal for accommodating bars, lounge areas and cloakrooms. This 3m x 12m veranda is ideal for extending the party atmosphere outside and are best used in fair weather creating a shaded terrace for lounge furniture or to add an al fresco feel to dining areas. 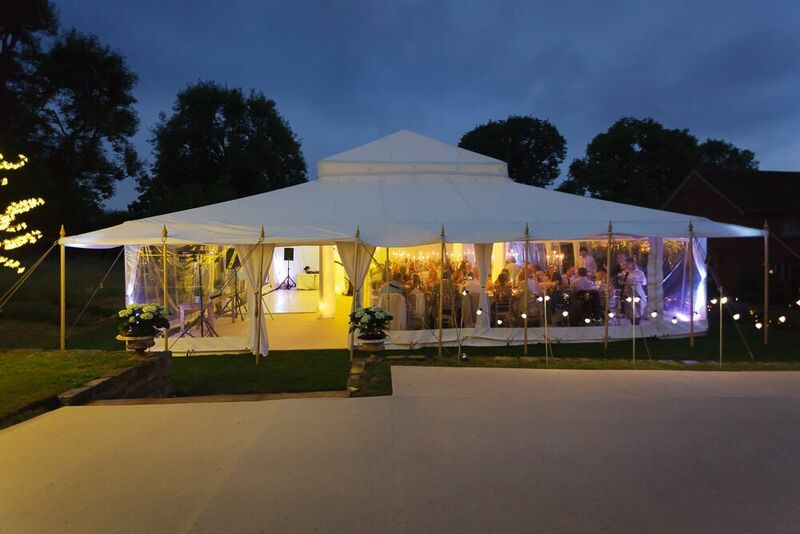 This 3m x 21m veranda is suitable for use on the Dana Pearl Tent and creates a sweeping terrace in fair weather to the side of the entire length of the structure, ideal as an entrance extension. 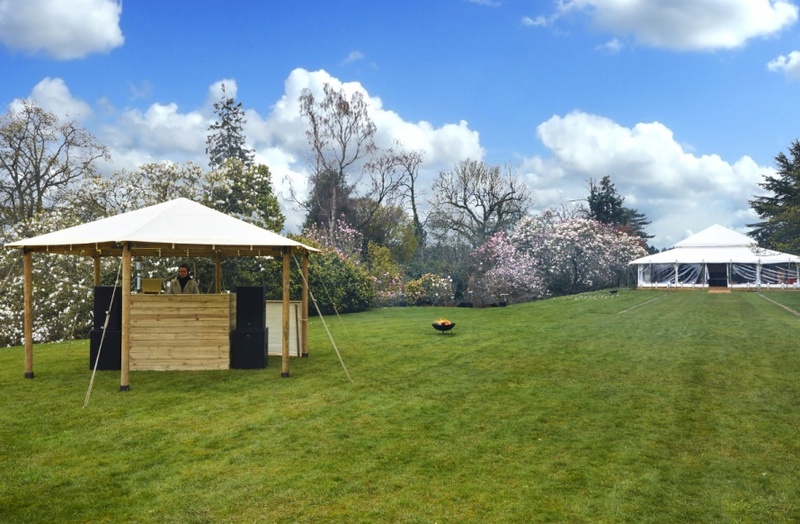 These 5m diameter octagonal canvas tents are rustic structures that work well with the exterior of the tents and are often used as outdoor bar areas, or as shade creators during a reception. 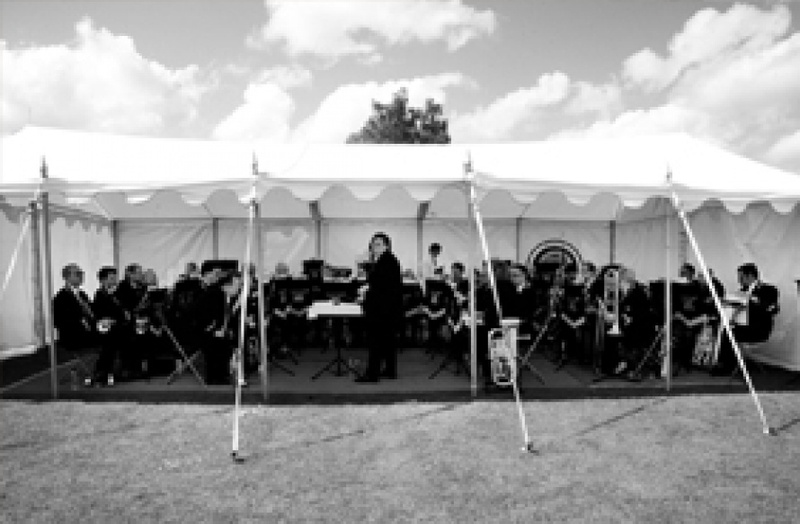 This 6m x 10m canvas tent blends well with the exterior of the Pearl, making it ideal to be used as a front-of-house catering area, or a stand-alone tent to accommodate reception drinks or even a brass band as pictured above. 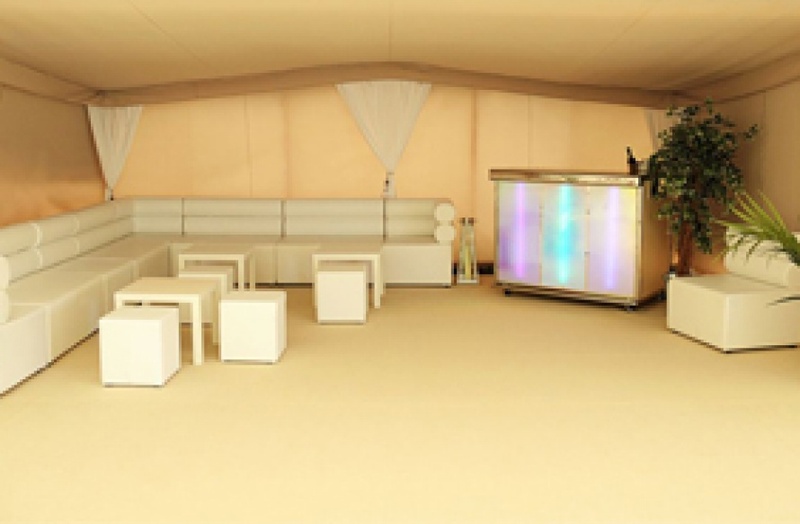 Our canvas catering tents have high peaked tops and come in a few useful sizes – 4m x 8m, 6m x 6m or 6m x 12m and are provided with coir flooring and internal lighting as standard as well as a baffle to connect to the main tent.